Are Nigerian video stories examples of "community media" ? Are these films just low budget attempts to mimic Hollywood and Bollywood? How have their grass roots distribution networks impacted media consumption in West Africa? This exhibition in Berlin is an assessment of some of the more interesting films that this prolific movement has produced. 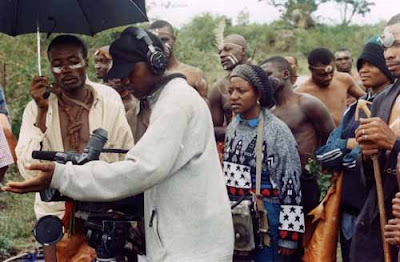 The Nigerian video-film industry started with a guerrilla attitude and grew over the past 15 years to be the third largest film industry worldwide, releasing more than 30 films per week. Strongly linked to daily West African life and told from a native point of view, Nollywood reaches its audience with stories of common concern, such as love, faith and betrayal. The introduction of affordable recording techniques promoted the rise of an industry whose medium was to become a mean of expression for future filmmakers. They distribute their movies in VHS and DVD to reach a large audience via sidewalks and local markets. The technical advancement provides not only a voice to many filmmakers. The democratization of movie making also allows for a much shorter production time that enables them to respond faster to reality's development. Certain political events have turned into films only two weeks after taking place, fictionalizing reality by filling the gaps of missing information with personal or collective narratives. Apart from the appearance of some Nollywood films at international festivals, this genre remains an African phenomenon - widely accessible and influential in Africa, with its own modi of circulation and distribution, but hardly to be found at international rental stores. Our eyes are bruised by Nollywood. The sequels just like a nation’s transitions in slow painful motions. hindered by troubling writer’s block. who aborted pregnancies of yester-years. is stolen even before birth. Mid-wives are still in morality training school taking lessons before their test. and supervision of cash and carry consultants.